Albert Jones was born on October 8, 1950, to the late LeeRoy Jones and Mary L. Vason Starks in Birmingham, Alabama. He accepted Christ at an early age and joined Eastern Star Missionary Baptist Church where he served as a member under the leadership of Pastor Randolph Austin and Pastor Lawrence Hill. Albert graduated from New Castle High School. Later he attended Lawson State College. Albert retired from Stockham Valves and Fittings. Albert met and married Toni Sanders on February 13, 1980, and to this union a loving family was born. He was preceded in death by his mother, Mary L. Vason Starks; his father, LeeRoy Jones; two brothers, Thomas A.J. Vason and John Starks; and a sister, Evelyn Henderson. 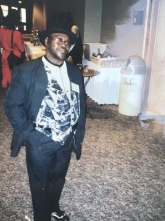 He departed this life on March 28, 2019, and leaves to cherish his memories: his beautiful wife, Toni Jones; a loving daughter, Wanda Sanders-Boyer (Michael); a loving son, Christopher Jones (Patricia); one brother, Reuben Jones (Jessica); eleven grandchildren, Robert Tremble III (Christian) of Greensboro, North Carolina, ShaKiyla, Karyn, Stephanie, Treshawn, Cedric, LeDarius, Demarcus, MaKiyia, Breaunna, and Keauna; and a host of great-grandchildren, nieces, nephews, cousins, in-laws, other relatives, and friends. To send flowers or a remembrance gift to the family of Albert Lee Jones, please visit our Tribute Store. "Email Address" would like to share the life celebration of Albert Lee Jones. Click on the "link" to go to share a favorite memory or leave a condolence message for the family.